Do you annoy by the various security alerts when surfing from website in one security zone to another security zone, or mixing security integrity levels, or having to open separate windows to switch between intranet sites and Internet sites, or extensions unable to save a file to a particular folder in user profile, or when a website wants to open web content using a program on your computer, or unable to receive windows message, or cannot connect to a shared printer by using Internet Explorer 7, or add-ons unable to install properly and many other problems? These errors are symptom of the problems caused by Protected Mode for IE, implemented since Internet Explorer 7 in Windows Vista, which are enabled by default is all security zones except Trusted sites zone. 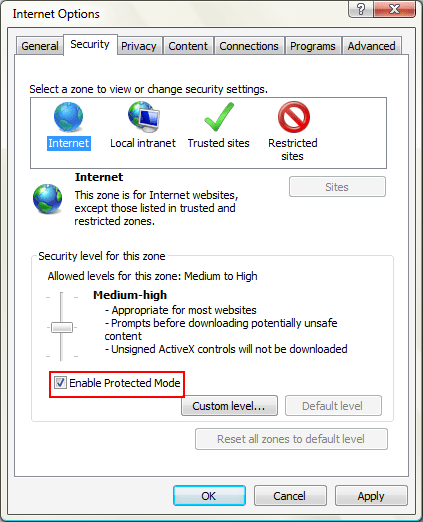 Protected Mode in Internet Explorer will prompt user to confirm the medium integrity elevated process, as the default Low rights unable to execute the action. Windows IE Protected Mode helps protect users from attack by running the Internet Explorer process with greatly restricted and isolated privileges or Low rights, together with add-ins installed on IE such as ActiveX controls and toolbars, even if the logged-on user is an administrator. In Protected Mode, IE writes and reads to special Low versions of the cache, TEMP folder, Cookies and History (only Favorites folder is shared across modes), while most other file system and registry would has restricted access and off-limits to it for writing. The design significantly reduces the ability of an attack to write, alter or destroy data on the user’s machine or to install malicious code, as even an attacker manages to defeat every defense or protect mechanism and gained control of the IE process, and run some arbitrary code, that code would be severely limited in what it could do as it does not have enough privileges to install software program, put files in the user’s Startup folder, hijack browser settings, or other hacks. If you have status bar shown, double-click on the lower right corner of any IE window where there is a indicator showing the security zone you’re on (normally Internet is showing if you’re surfing web – see figure 1) to open Internet Security Properties dialog window. Or alternatively, go to Tools -> Internet Options, then click on Security tab, which is the same with Internet Security dialog box (figure 2). Uncheck or untick the Enable Protected Mode check box. After unselected it, click on OK, and restart Internet Explorer to make the change effective. If you’re prompted with Warning! dialog that the current security settings will put your computer at risk, click on OK.
Again, this is pretty obvious, if you want to enable the Protect Mode again after disable or turn it off, simply select the check box of “Enabled Protected Mode” again to turn if back on.